At the mention of the Safaricom choir, it is impossible to avoid thinking of their 2010 tune for the company, “Niko na Safaricom”. For a long time at the turn of the decade, the two went hand in hand. 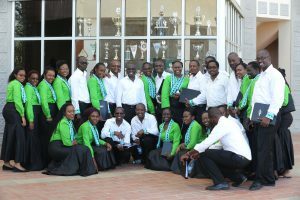 Not only did the song make the choir popular, but it also successfully anchored in Safaricom’s commitment to the promotion of patriotism and unity as national values. It is one-and-a-half minute song in which the group sings about the pride of being a Kenyan and gifts Kenyans have and associates these points with being a Safaricom subscriber. The video features shots of the choir singing at different locations around country. For Ken Wakia making “Niko na Safaricom” is the most memorable thing the choir has ever done. The music director explains why: “Partly because it was something novel. Before that production, I don’t think any business in Kenya had produced a jingle that captured the imagination of Kenyans in general, not just businesswise. It’s a jingle that brought life to Kenya itself. There were areas that we shot from that not many Kenyans even imagined that that was Kenya. That I would say is one thing that we have been very proud of,” he says. The song is an original composition by Gabriel Omondi. For Wakia and his team, it took about a month to perfect the tune. The choir has had the opportunity to work with many leading music directors and conductors. One is Esther Jones, the deputy musical director of the National Youth Choirs of Great Britain. She came in 2010. The Safaricom choir usually performs at many events, such as the annual Christmas concert by Capital Club East Africa in Nairobi, but they are not paid for this. Money raised from gate collections goes to different charity organisations. Wakia says they do this as part of their community service. Choir members are not paid by Safaricom for their services. “Generally, we don’t take random invitations. We go to events where that make sense, for example for good causes,” says Wakia, who will lead the choir in performing at the World Youth Choir session in Pécs, Hungary in July. “It’s voluntary but they’re given (money for) expenses, which is mainly bus fare so that when they finish rehearsal they can get back home,” the music director says. 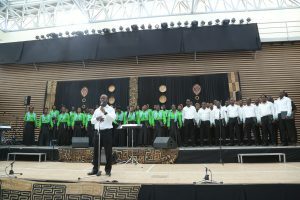 The choir has been performing with the Safaricom Youth Orchestra, another musical project by the communication company, at concerts since the latter was launched in 2014. The farthest the Safaricom choir has travelled to perform is Mombasa in 2013 and 2016. Last year, they were invited to the Brandenburg Choral Festival of London but could not go “partly because moving that many people would drain the coffers,” Wakia explains. What songs does the choir sing? The music director says over the years, he has found out the members enjoy performing arrangements of popular music, so they do a lot of this. He says he has introduced arrangements of songs from popular music including from musicals. “…but then, alongside that, I always introduce different genres of music, so I would bring in purely classical music, like something by (the German George Frideric) Handel or something by (the Austrian Wolfgang Madeus) Mozart,” he says. Some of the many compositions and arrangements they have performed include works of Kenyan musicians Eric Wainaina, Arthur Kimoli and Dorothy Zalo. According to Wakia, one piece of work the choir has loved performing over its eight years of existence is “Gloria in Excelsis Deo” a hymn by the Italian baroque composer Antonio Vivaldi. They also love performing “Ukuthula”, a Zulu peace song, which “simply brings tears to everyone who hears it,” the music director says. Last year, on the International Day of Peace on September 21, the Safaricom Choir was part of about 500 singers who met at a peace concert at Kenya National Theatre in Nairobi to perform “Ukuthula”. What the music director loves the most about his job is seeing people from diverse backgrounds come together and produce one thing in harmony. “There’s nothing better than music in bringing people together because we are all working towards one goal, which is to sing one song and to sing it perfectly,” he says. “It’s incredible when we arrive at rehearsal and everyone is coming from all different points, different parts of Safaricom, and they’re all coming for one purpose,” he says. The music director says Safaricom’s entire management is very approachable and the current chief executive Bob Collymore and his marketing team have been extremely supportive. “You know, usually it’s difficult to sustain something that your predecessor has started. And so I have a lot of respect for Bob for taking up this group and seeing its usefulness within the establishment that he found it wise to keep it going,” Wakia says. Equally supportive was Collymore’s predecessor Michael Joseph, who challenged him to start the choir.